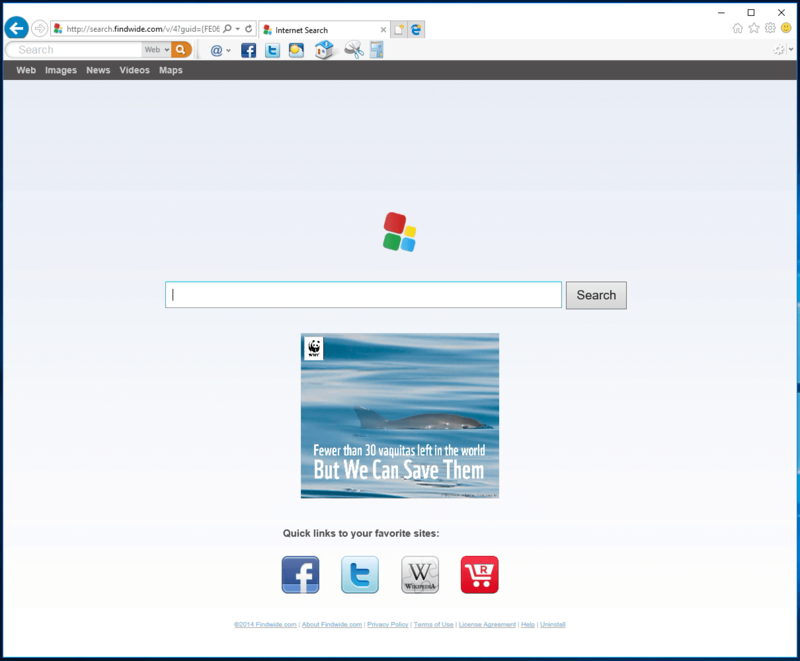 FindWide is a browser addon for Internet Explorer. This addon Hijacks your home page and internet search provider changing it to search.findwide.com. Alternate versions change the homepage to search.us.com. This addon monitors your user activity while you are surfing the web. It collects user and browsing data, that it uses to better display targeted ads. While browsing with this addon enabled you will see additional ads, sponsored links and even sometimes pop-up ads displaying throughout your browsing sessions. Several anti-virus programs have marked this addon as a Browser Hijacker and is therefore not recommended to keep on your computer. From the Author: Each search engine has its own method of searching and each will return different results. Findwide.com looks at all of them, decides which are most relevant to your search, eliminates duplicates and revals them to you. In the end, you get a list of results more complete than using any one search engine alone. Browser hijacking is considered the internet’s constant problems that target internet browsers. It is a type of malware program that modifies your internet browser’s settings and redirects you to sites or pages that you had no intention of checking out. Nearly all browser hijackers are made for marketing or advertising purposes. Generally, it’ll drive users to predetermined websites which are looking to boost their ad earnings. Even though it might appear naive, these tools were created by vicious people who always attempt to take full advantage of you, so that hackers can easily make money from your naive and distraction. Browser hijackers can also allow other destructive programs without your knowledge to further damage your computer. The following are some symptoms that indicate you’ve been hijacked: you notice unauthorized changes to your internet browser’s home-page; bookmark and new tab are likewise modified; the main web browser settings is altered and undesirable or unsafe sites is put into the trusted sites listing; you are getting browser toolbars you have never noticed before; many pop-up ads appear and/or your browser pop-up blocker is disabled; your web browser starts running slowly or exhibits frequent errors; you can’t go to specific sites like homepages of anti-malware software. Browser hijackers might use drive-by downloads or file-sharing networks or an e-mail attachment in order to reach a targeted PC. They also come from add-on software, also called browser helper objects (BHO), web browser extensions or toolbars. Also, some freeware and shareware can put the hijacker inside your computer through “bundling”. A good example of some notorious browser hijacker includes Anyprotect, Conduit, Babylon, DefaultTab, SweetPage, Delta Search, and RocketTab, however the names are continually changing. Browser hijackers might record user key strokes to collect potentially important information leading to privacy concerns, cause instability on systems, drastically disrupt user experience, and ultimately slow down the PC to a stage where it will become unusable. Some browser hijacking could be simply corrected by discovering and removing the corresponding malware software from your control panel. But, most hijackers are hard to eliminate manually. No matter how much you try to remove it, it may come back over and over. Novice computer users should never try for the manual form of removal methods, since it needs detailed computer knowledge to carry out fixes on the system registry and HOSTS file. Installing and running anti-malware software on the affected computer could automatically delete browser hijackers and other malicious applications. 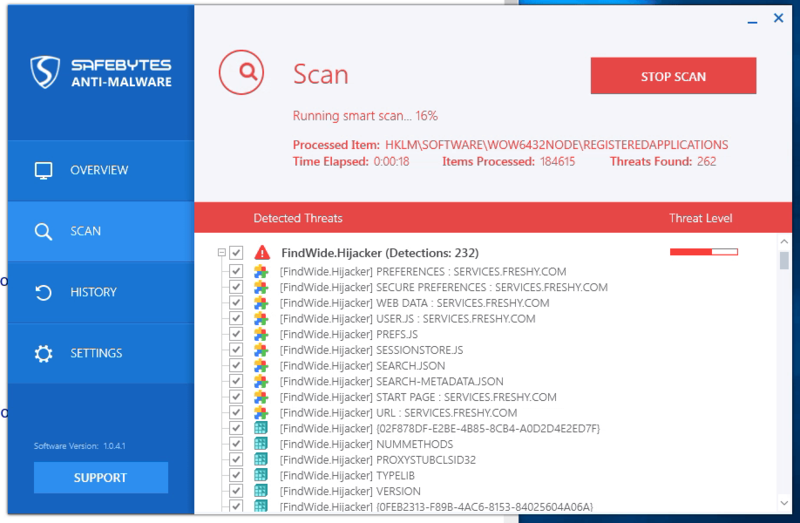 SafeBytes Anti-Malware discovers all kinds of hijackers – such as FindWide – and removes every trace quickly and efficiently. Employ a system optimizer (like Total System Care) together with your anti-malware software to fix various registry issues, eliminate system vulnerabilities, and enhance your computer overall performance. Viruses could cause plenty of damage to your computer. Some malware is meant to restrict or block things that you wish to do on your personal computer. It may well not permit you to download anything from the net or it will stop you from accessing some or all websites, especially the anti-malware websites. If you’re reading this, you probably have got infected by a virus that prevents you from installing a computer security program like Safebytes Antimalware on your PC. Even though this kind of problem can be tougher to get around, there are some steps you can take. If any virus is set to run automatically when Microsoft Windows starts, entering Safe Mode could block the attempt. Since only the bare minimum applications and services launch in safe mode, there are seldom any reasons for conflicts to take place. To launch your Windows XP, Vista or 7 PCs in Safe Mode with Networking, follow the instructions below. 1) Press the F8 key continuously as soon as your computer boots, but before the big Windows logo comes up. This will bring up the Advanced Boot Options menu. 2) Choose Safe Mode with Networking using arrow keys and press ENTER. 3) When you are into this mode, you will have online access again. Now, utilize your browser to download and install Safebytes. 4) Following installation, do a full scan and let the software get rid of the threats it discovers. Certain malware might target vulnerabilities of a specific web browser that obstruct the downloading process. In the event you suspect that your Internet Explorer has been hijacked by a malware or otherwise compromised by hackers, the best course of action is to switch over to an alternate internet browser such as Chrome, Firefox, or Safari to download your chosen computer security application – Safebytes Anti-Malware. Here’s another solution which is using a portable USB anti-malware software that can scan your computer for malicious software without needing installation. Follow these steps to run the anti-malware on the affected computer system. 1) Download Safebytes Anti-Malware or MS Windows Defender Offline onto a clean computer. 3) Double click the exe file to open the installation wizard. 4) When asked, select the location of the pen drive as the place in which you want to put the software files. Follow the directions to complete the installation process. 5) Transfer the USB drive from the clean PC to the infected PC. 7) Press the “Scan” button to run a full computer scan and remove malware automatically. If, after all of these methods, you’re still having problems with a possible infection, go ahead and contact us with your question, via chat or e-mail. If you’re already a Safebytes customer, you can call our toll-free number 1-844-377-4107 to get product support and expert solution from our technical team. To help protect your computer or laptop from various internet-based threats, it is very important to install anti-malware software on your computer system. However, with countless numbers of antimalware companies in the marketplace, nowadays it is actually challenging to decide which one you should obtain for your laptop. A few are good ones, some are decent, while some are simply just fake anti-malware software which will harm your PC themselves! You must be careful not to choose the wrong product, especially if you buy a premium program. Among few good applications, SafeBytes Anti-Malware is the highly recommended program for the security conscious people. SafeBytes anti-malware is a trustworthy tool that not only protects your PC completely but is also very easy-to-use for people of all skill levels. With its cutting edge technology, this application can help you eliminate multiples types of malware like computer viruses, trojans, PUPs, worms, ransomware, adware and browser hijackers. Real-time Threat Response: Malware programs attempting to enter the system are discovered and stopped as and when detected by the SafeBytes active protection shields. This tool will always monitor your PC for any suspicious activity and updates itself continuously to keep current with the latest threats. Robust Anti-malware Protection: By using a critically acclaimed anti-malware engine, SafeBytes offers multi-layered protection that is made to catch and eliminate threats which are concealed deep inside your computer. Web Filtering: Through its unique safety score, SafeBytes alerts you whether a website is safe or not to visit it. This will assure that you’re always certain of your safety when browsing the net. Lowest CPU/Memory Usage: SafeBytes is well-known for its low effect on computer resources and great detection rate of countless threats. It runs quietly and efficiently in the background so you are free to use your computer at full power all the time. Fantastic Technical Support: Support service is accessible to 24 x 7 x 365 days via chat and email to answer your queries. To conclude, SafeBytes Anti-Malware is really great for securing your computer against all sorts of malware threats. Once you’ve installed SafeBytes Anti-Malware, you will no longer have to bother about malware or other security concerns. If you’re searching for a comprehensive antivirus program that’s still easy to use, SafeBytes Anti-Malware is just what you need! If you do not wish to use an automated tool and like to eliminate FindWide manually, you could possibly do so by going to the Windows Add/Remove Programs menu in the Control Panel and deleting the offending program; in cases of browser plug-ins, you can un-install it by visiting the browser’s Add-on/Extension manager. You might also want to reset your home page and search engine providers, and also clear your browser cache and cookies. Finally, examine your hard disk for all of the following and clean your Windows registry manually to remove left over application entries following uninstalls. But bear in mind, this is often a complicated task and only computer professionals could perform safely. In addition, some malware is capable of replicating or preventing removal. Carrying out this malware-removal process in Safe Mode is suggested.